The basilisk, (sometimes referred to as a Cockatrice), is a mythical creature most often depicted as a reptile, and is reputed to be king of serpents. One of the most feared of all mythological beasts, a basilisk is said to have the power to cause death with a single glance. In this aspect it bears similarity to the Gorgons of Greek mythology. Some have speculated that the cobra may be the origin of the basilisk, since it has some of the characteristics of the mythical creature, including being able to kill from a distance, albeit by spitting venom rather than by a glance from its eye. Whether or not that is the origin, the symbolism of the snake as the cause of death and the incarnation of evil resonates with Christian symbolism of the devil or Satan as the "ancient serpent" in the Garden of Eden who tempted Eve and caused the fall from grace of the first human beings. Defeat of this evil comes not through physical strength but through reversing the direction of the evil glance back to its source, killing the basilisk. The word basilisk in English stems from the Greek βασιλίσκος basiliskos, which translates as "a kinglet, a kind of serpent." In Latin, the creature is basiliscus, and in French, it is basilique, both of which influenced the eventual Anglicization of the word, into basilisk. The etymology of the term "cockatrice" is more convoluted; appearing in many of the Classical and Early languages of Europe, the Old French cocatris was adopted into Middle English as cocatrice, and eventually evolved into the modern cockatrice. Although the two terms may not be mutually exclusive, both are commonly used to describe, if not the same creature, then two creatures of pronounced similarity. There are three descriptions of the mythical basilisk: a huge lizard, a giant snake, or a composite of a reptile and rooster, often with the head, plumage, and front legs of the rooster, and a reptilian tail, and sometimes scaly wings. (This last form is often the one described as a cockatrice.) The abilities of a basilisk are just as diverse; its ability to kill any living creature simply by gazing into the eyes of its prey is almost universal, but some attribute such other fearsome traits as the ability to breathe fire (much like a dragon), the ability to deliver lethal venom through a bite, and the ability to fly. It is almost always assumed to be a fierce predator and extremely hostile, and is often looked upon with dread as a creature of pure evil. The basilisk is fabulously alleged to be hatched by a cockerel from the egg of a serpent (the reverse of the cockatrice, which was hatched from a hen's egg incubated in a serpent's nest). The basilisk may be killed by gazing at its own reflection in a mirror. According to some legends, basilisks can be killed by hearing the crow of a rooster or gazing at itself in a mirror. Tales are told that Alexander the Great ordered a mirror be placed between his army and a basilisk that was defending a city. Upon seeing its reflection the monster died instantly. Similarly, Saint George held his shield so that a basilisk saw its own image, causing its death. Its natural enemy is often said to be the weasel, who is immune to its deadly gaze and can survive its venom. Basilisk is also the name of a genus of small lizards, (family Corytophanidae). The Green Basilisk, also called plumed basilisk, is often called the "Jesus lizard" for its ability to run across the surface of water. Some have speculated that reports of cobras may have given birth to the stories of the monster basilisk. The cobra can maintain an upright posture and, with its inflated neck hood, makes quite a terrifying sight. The venom of the King cobra, which has a crown-like symbol on its head, is capable of killing a human with a single bite. In addition to a deadly bite, the Egyptian cobra can incapacitate larger animals by spitting venom into their eyes from a distance. The Egyptian cobra lives in the desert and has been used as a symbol of royalty. Also, the cobra is often killed by the mongoose, which although not directly related to the weasel, bears some similarity as both are small carnivorous mammals. It routs all snakes with its hiss, and does not move its body forward in manifold coils like the other snakes but advancing with its middle raised high. It kills bushes not only by its touch but also by its breath, scorches up grass and bursts rocks. Its effect on other animals is disastrous; it is believed that once one was killed with a spear by a man on horseback and the infection rising through the spear killed not only the rider but also the horse. Author Bede was the first to acknowledge the legend that a basilisk is born from the egg of an old rooster, then other authors added the condition of the constellation Sirius being ascendant in the sky at the time. Isidore of Seville defined the basilisk as the king of snakes. Alexander Neckham was the first to say that not the glare but the "air corruption" was the killing tool of the basilisk, a theory developed one century later by Pietro d'Abano. 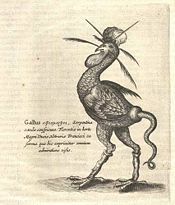 Albertus Magnus in the De animalibus wrote about the killing gaze of the basilisk, but he denied other legends, such as the rooster hatching the egg. He gave as source of those legends Hermes Trismegistus, who is credited also as the creator of the story about the basilisk's ashes being able to convert silver into gold; the attribution is absolutely incorrect, but it shows how the legends of the basilisk were already linked to alchemy in the thirteenth century. The basilisk usually represents evil and is a symbol of death. Christianity employed the symbol of the basilisk at times, and as with a number of other serpents, immediately cast it as a demon or representative of the devil itself. Therefore, it was often depicted in Church murals or stone carvings, often slain or being defeated by a Christian knight to symbolize the ability to overcome evil. Around the same time, the basilisk became incorporated in heraldry, specifically in the town of Basel, Switzerland. Heraldic images blend the famous Bishop of Basel's coat of arms with the basilisk. 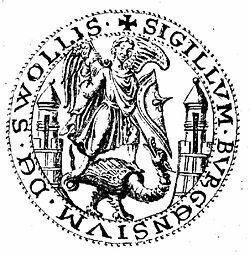 The Bishop was forced out during the Protestant Reformation, and the basilisk was blamed for an earthquake in the city years before, so that these two seeming regrettable events became, and still are, the symbol of Basel. In alchemy, the basilisk played dualistic roles. It could represent the powerfully destructive force of fire, which breaks down elements to allow transmutation of metals, or the immortalizing tonic produced by the philosopher's stone. A basilisk is mentioned in chapter XVI of The Zadig by Voltaire, and a basilisk's look is mentioned in the fourth chapter of Bram Stoker's Dracula, when the main character makes his first attempt to kill Count Dracula. In contemporary times, the most famous basilisk comes out of the Harry Potter series. In the second book, Harry Potter and the Chamber of Secrets, author J. K. Rowling employs a basilisk as the creature under the control of dark wizards who use the beast to cleanse the world of those with "impure" blood. While the fantasy sub-culture remains strong in contemporary times, the basilisk is not often used explicitly. The role-playing games Dungeons and Dragons and Magic: The Gathering have used somewhat traditional basilisk-like creatures, while other books and video-games occasionally borrow aspects of the basilisk for use. When a basilisk is used, it is often in the giant snake form, or completely reptilian in nature; the cockatrice chimera is very rarely depicted. ↑ 1.0 1.1 The Oxford English Dictionary (Oxford Press, 1971, ISBN 019861117X). ↑ Joe Nigg, The Book of Dragons & Other Mythical Beasts, (Barron's Educational Series, 2001, ISBN 978-0764155109). ↑ Micha F. Lindemans, "Basilisk" Retrieved October 4, 2007. ↑ 4.0 4.1 Monstrous.com, Basilisk. Retrieved October 4, 2007. ↑ 5.0 5.1 Peter Costello, The Magic Zoo: The Natural History of Fabulous Animals (St. Martin's Press, 1979, ISBN 0312504217). ↑ Philomon Holland, (Translator), The Historie of the World Booke VIII. Retrieved October 4, 2007. ↑ Joe Nigg, Wonder Beasts: Tales and Lore of the Phoenix, the Griffin, the Unicorn, and the Dragon (Libraries Unlimited, 1995, ISBN 156308242X). 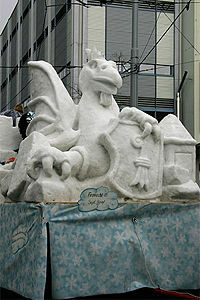 ↑ all-about-switzerland.info, The Basilisk: Basel's Heraldic Animal. Retrieved October 4, 2007. ↑ David Colbert, The Magical Worlds of Harry Potter (Berkley Trade, 2008, ISBN 0425223183), 36. This page was last modified on 12 December 2016, at 22:58.